A small and lively city, San Francisco has an estimated population of over 834000. The fog city is well known for its historic landmarks like Golden Gate Bridge, cable cars, steep rolling hills and outstanding architecture but Did You Know that San Francisco is one of the richest cities in the world and has one of the nation's highest concentrations of new immigrants. Delve in some interesting facts about this elating city and get enlightened. San Francisco is the 14th-most populous city in the United States. San Francisco is the fourth-largest city in California. SFO is surrounded by water bodies on three sides. San Francisco Bay is the world's largest land-locked harbor. The city encompasses over 50 hills. Mount Davidson, 925 feet (282 m), is San Francisco's tallest hill. Human habitation of the San Francisco city dated back to 3000 B.C. The Yelamu group of the Ohlone people were considered the native inhabitants of the city before the European exploration. The first recorded European visit in the city was the Spanish party, led by Don Gaspar de Portola on 1769. The California Star became the first newspaper published in San Francisco. John W. Geary was the first governor general of San Francisco, elected on May 1 1850. Not a single San Francisco-based bank collapsed during the Depression. SFO is both a city and a county. San Francisco has a mayor-council form of government. SFO maintains a high standard of living with an exceedingly high cost of living than the national average. The income of the San Francisco Bay Area's residents is above average and are among the highest in the nation. Among all US states, San Francisco has the second-highest percentage of residents with a college degree. 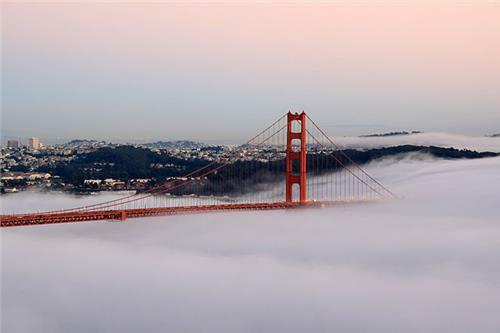 SFO has been nicknamed as "The City by the Bay", "Fog City", "Baghdad by the Bay," and "The Paris of the West." Motto of San Francisco is "Gold in Peace and Iron in War"
The flower of San Francisco is Dahlia. San Francisco General Medical Center is San Francisco's largest hospital. SFO host the nation's third-largest marathon, the San Francisco Marathon, held ever year in July. Golden Gate Bridge is the world’s second longest single span bridge. San Francisco has the highest percentage of gay and lesbian individuals in America. Filbert Street is the steepest street at 31.5 degrees. San Francisco is the birth place of Irish Coffee. San Francisco’s cable cars are the only National Historical Monument that are movable. Al Capone was jailed for five years in Alcatraz. Makato Hagiwara invented the Chinese Fortune Cookie at the Japanese Tea Garden. Lombard Street is America's crookedest street. The city has the highest number of homeless inhabitants per capita of any major city in the United States.